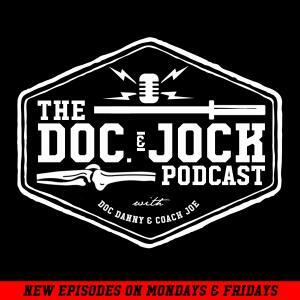 Happy Friday from the Doc and Jock Podcast. On this edition of our Friday short Doc Danny tackles a listen question about elbow pain. Remember gang, if you want your questions answered and training issues fixed by Doc and Jock submit them in the form of an iTunes review and we will jump right on it! Some folks reference medial elbow pain as golfer's elbow, Danny calls it Weightlifter’s elbow. The fact is that most Weightlifting variations utilize a hands down position which can potentially lead to muscle tightness if you do not proactively change up the position and/or introduce contrast. One of the best ways to help with this type of pain is simply hanging from a pull up bar in a supinated or chin up position. Let gravity do the work as you attempt to increase hold times. The Mobility WOD voodoo also seems to really help alleviate elbow pain. Wrap the elbow, check out Danny’s video at the Athlete's’ Potential youtube page, and work through push ups, elbow circles and other simple movements. If the pain persists you should see a pro! A lof of the tightness in the forearm and bicep that causes this sort of pain can be quickly relieved by a few dry needling sessions and/or soft tissue work. Once you are healthy and pain free start small, move slowly, and perform strict variations first. If the front rack hurts start with push ups and horizontal press variations. As the front rack gets comfy perform strict press, then the faster push presses, and lastly get after jerks! If the new and faster variation aggravates the elbow drop load or walk your progression back to the variation with no pain. Gang, we hope this helps make your next training session enjoyable! In the meantime be sure to head over to www.docandjock.com and download out FREE 7 Day Mobilty Overhaul. To stay ahead of the game bullet proof your trunk with our Everyday is Back Day training guide. If you have a body, you’re an athlete!